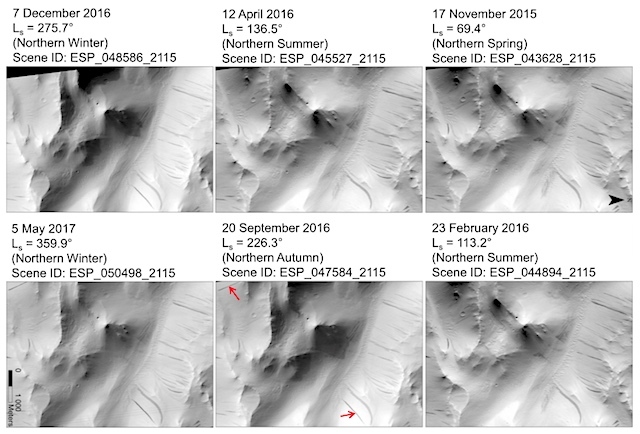 Are Slope Streaks Indicative of Global‐Scale Aqueous Processes on Contemporary Mars? Slope streaks are prevalent surface features on contemporary Mars. They have dark albedo and are abundant in the equatorial and subequatorial latitudes. The exact mechanisms behind their formation and development are still unknown, and several hypotheses have been proposed based on the physicochemical and geomorphological properties of slope streaks. These features generate a common interest because several hypotheses have linked them with transiently flowing liquid water on the Martian surface. Such probable linkages with Martian liquid water can have wide implications for understanding habitability conditions and ongoing water cycles on Mars and for evolving planetary protection policies to prevent possible contamination of Martian surface during future missions. Therefore, here we perform a systematic evaluation of the literature covering morphological and flow characteristics of slope streaks for water‐driven or dry dust avalanche mechanisms. We discuss the probable limitations of the various proposed models for slope streak development and provide perspectives on the plausible processes driving global‐scale slope streak formations on Mars. This entry was posted in Reports and tagged aqueous processes, dark slope streaks, recurring slope lineae, RSL, slope streaks, water. Bookmark the permalink.